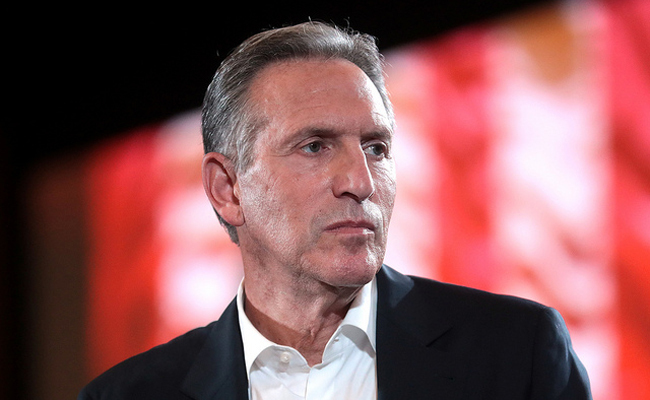 Long-time Starbucks CEO Howard Schultz received a frosty reception in his hometown of Seattle recently when he not-quite-announced a presidential bid as an independent. He’s a reasonably well-liked guy, at least as billionaire titans of industry go. Schultz is a major Democratic donor and political activist, and he seems to strive to be an ethical employer and private sector leader. But this recent backlash in response to his presidential ambitions suggests that, even among his neighbors, there’s little desire to swap one billionaire president for another — regardless of their political leanings. Here’s why electing a billionaire of any party is a major issue. “Grande ego. Venti mistake.” This was a clever protest sign aimed at Schultz, and it may echo concerns that his choice to run as an independent could split the liberal vote and keep Trump in office. But the shot about his ego could equally apply to Trump. And while Schultz isn’t a fan of the Republican incumbent, he sure is taking his cues from him. Why does Schultz think he is qualified to run the country when he has no practical experience in politics or public service? Is it in part because, as the head of a major and well-known company, he makes the news as frequently as top national political personalities? Does Schultz equate his similar level of celebrity to being equally qualified for the top job in politics? When top executives switch companies, they don’t start in the mail room. They go from president of one business to CFO of another. Even if Schultz was heading up a lesser-known company in a non-public-facing industry, this would be true. But learning the basics on the ground is actually pretty important when you’re running an entire country. Skipping straight to the highest office is not only egotistical, it should be frightening for those of us who have experienced Trump’s incompetence first hand. What about running for mayor first — or the House, or the Senate, or state Senate? What about learning the practical realities of people depending on you to pass appropriate legislation to solve societal problems or to make sure the streets are cleaned? It’s a common refrain on the right, and Trump has shown just what that looks like – from the brinkmanship of the shutdown to various international trade deals and alliances used as bargaining chips. But the government isn’t a business; it’s a provider of essential services which need to be operated effectively and funded consistently. In other words, you can’t take a high-risk, high-reward approach and then file for Chapter 11 when it doesn’t work out. A businessman’s view of the world has some major blind spots, including a little too much attention to financial numbers as “the bottom line” and too little to long-term thinking. Schultz is better than some, but his very belief that his business experience qualifies him for the Oval Office suggests he has also made this false equivalency. The truth is that most people do want the president — and most government representatives, in fact — to be exceptional. Barack Obama, with a background as a student at Harvard Law School, civil rights lawyer, community organizer, constitutional law instructor, senator and finally president, certainly was. The president should represent the best of the United States, both as a nation and as a philosophical concept. But that individual should also represent the best of what real Americans are. And a billion-dollar gap separates even the most progressive and down-to-earth members of the super-rich from the rest of us. Trump is so far removed from reality that he thinks you need photo ID to purchase food at a grocery store, and he doesn’t seem to know how to close an umbrella. Schultz may be a nice guy, but does he really have any idea what the lives of his own employees are like? I hate to keep bringing up Alexandria Ocasio-Cortez, but as a millennial, she has experienced the same circumstances as many young Americans have. For instance, she has worked hard to earn a university degree — collecting a lot of student debt, in the process — and worked as a bartender in New York. No one gave her a billion dollars. Schultz may be a smart and hard-working guy, but he’s also extremely lucky. Ocasio-Cortez’s issue with people making tens of millions a year and paying minimal taxes certainly resonates. So in the end, maybe there shouldn’t be any billionaire presidents — because, as Michael Moore has suggested, there ought not to be any billionaires in the first place. Maybe no one really needs that much money — and, if you think you do, maybe you shouldn’t be in charge of making decisions that affect the rest of us. Hope Americans have learnt their lesson having elected Trump. The people in Palestine will suffer even more. Just because you became rich by ripping off other people and cheating on your taxes like this crook Trump, doesn't mean you are automatically qualified to be president. If the current collection of Socialist Democrat (red star cap-ed Mao Zedong) presidential contenders get their job , they will need to build a wall to keep Americans from leaving. Billionaires are out of touch with reality, insulated by their gazillions. They know nothing of working-class struggles to keep up with rent and bills while putting meals on the table. They have never experienced the phenomenon of month being left over at the end of the money. They have never looked into an empty cupboard and turned around to see little hunger-strained faces. They have never juggled two or three or even more part-time gigs with raising a family. They have never lectured kids about leaving lights on and wasting electricity (or been lectured at), or stood in line at a food bank, or told whiny kids to be thankful for anything on their plates. They have never prayed for good health and protection from accidents because they can't afford medical bills. And so on, and so on, and so on. No surprise the reich-wing trolls slithered out of the sewer they share to vomit their bilge in the comments section.